Artemisia is the genus name for a group of 200 to 400 different species. It is composed of hardy herbaceous plants and shrubs. All artemisia species are bitter and have strong essential oils in them. Artemisia grows in the temperate areas of both hemispheres, usually in hot, semiarid areas. Most have hairy leaves and beautiful silvery green foliage. They are generally grown for this foliage, which overpowers the small flowers. Common names for some popular species include mugwort, wormwood, sagebrush, and tarragon. Mugwort (Artemisia vulgaris) is also called a number of other names, including common woodworm, felon herb, chrysanthemum weed, wild wormwood, old Uncle Henry, sailor's tobacco, naughty man, old man or St. John's plant (not the same as St. John's wort). Many related plants are referred to as mugwort by people, but Artemisia vulgaris is most often meant when a plant is called mugwort. It is hardy to USDA zones 3-9. Mugwort is native to Europe, Asia, northern Africa and Alaska, and now grows wild in North America, where it is considered an invasive weed. The plant is silver grey, is bare on the upper side of its leaves and has hairs on the lower side of its leaves, and has small yellow flowers from July to September. Mugwort is a herbaceous perennial with a woody root. It grows three to six feet tall. It reproduces by means of rhizomes. The seeds produced in temperate areas are rarely viable. Mugwort is tolerant of most soils but prefers sandy, open areas and lime-rich soil. It grows well in slightly acidic to slightly alkaline soils. Mugwort prefers well drained areas and likes dry soil. It should only be watered during extreme drought. It grows best in full sun but can tolerate dappled shade. To grow mugwort, purchase a plant or break off a piece of rhizome from an existing plant and plant it. Mugwort should be planted after all danger of frost has passed. Seeds are ready to harvest in autumn. Leaves are harvested when needed. Mugwort is supposedly so named because it was used to flavor mugs of beer brewed by individuals for their own use. It went out of favor for this purpose when hops came into favor. It can cause dermatitis on contact to some individuals, should never be taken in quantities of greater than one ounce at a time or many days in a row, and should be avoided by pregnant women, who it may cause to miscarry. According to WebMD, it can be quite dangerous to use. Flowers or seed heads may be steeped into a tea. Leaves are used in small quantities as a digestive aid, especially in fatty foods. The Japanese use the young shoots as a potherb. Mugwort is often grown in gardens as an herbal insect repellent. 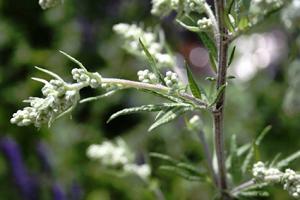 Mugwort is also used in homeopathic medicine to treat epilepsy. 'Powis Castle' artemisia is an evergreen perennial. It can also be classified as a shrub or sub-shrub. 'Powis Castle' is believed to be a cross between Artemisia arborescens and Artemisia absinthium. This plant is a beautiful silver grey plant that grows up to three feet tall and three to six feet in diameter. The leaves are like filigreed silver lacework. 'Powis Castle' rarely flowers, but occasionally produces six-inch panicles of silver, yellow-tinged flower heads. 'Powis Castle' grows in zones 6 to 8. It does not take heat in the summer well or cold in the winter well. It is propagated by cutting shoots in the summer and rooting them. Any seeds it produces will not produce a plant like its parent. 'Powis Castle' grows in full sun and prefers neutral to mildly alkaline, well-drained soil. It is drought tolerant but will rot in wet soil. It should be pruned in the spring when it first starts growing to keep it in a mound shape. 'Powis Castle' is used as an edging, in xeriscape gardens, cottage garden, rock garden, and in herb gardens. It is toxic and should not be consumed. 'Powis Castle' is planted for its dramatic foliage, not its flowers. 'Silver Mound' (Artemisia schmidtiana) is prized for its silver foliage and attractive mounding growth. It is a perennial with a low, spreading habit. 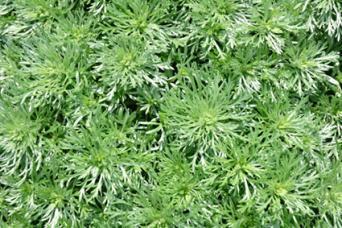 It is more heat tolerant than most artemisia plants and is not invasive. It lives in zones 4-8. 'Silver Mound' grows ten to twelve inches tall and rarely flowers. It is deer resistant and rabbit resistant. 'Silver Mound' is attractive to bees, butterflies, and birds. 'Silver Mound' grows in full sun. It likes dry soil and should be watered rarely after it is established. It is generally purchased as a plant, rather than propagated. However, it can be propagated by cutting shoots in summer and rooting them. 'Silver Mound' likes average soil. Very fertile soil makes it grow too fast, requiring division every year. Normally, it should be divided every two to three years. After planting 'Silver Mound', it rarely requires much in the way of maintenance. Trimming it in the spring will keep it in a nice mound shape. Do not trim old wood, trim back to a new bud. The trimmings can be rooted to start new plants. The plant can be sheared during the summer to create fresh foliage if needed. 'Silver Mound' is used as edging or an accent piece because of its spectacular foliage. It is perfect for a border or a meandering path. Because it is drought tolerant, it does well in a rock garden or other xeriscape. Sweet wormwood (Artemisia annua) is also known as sweet annie, sweet sagewort, annual mugwort or annual wormwood. 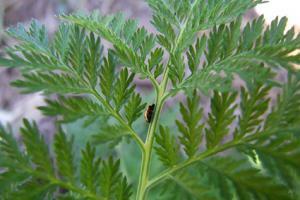 It is an annual herbaceous plant that has been used medicinally for centuries. It is from Asia but is widely naturalized around the world. Sweet wormwood grows to be nine feet tall and three feet wide and grows rapidly. Sweet wormwood is cultivated from seeds. These are sown after all danger of frost has occurred. The seeds are tiny and should be sown three feet apart in rows separated by three feet. Sweet wormwood can also be propagated by cuttings from another plant. This is done with spring shoots and is very labor intensive. Most people buy a sweet wormwood plant from the nursery. It needs direct sun and average soil. It does need well drained soil as it will not tolerate wet feet. It is drought tolerant. 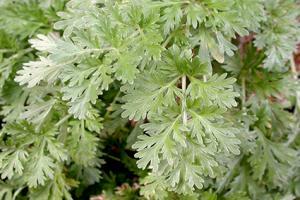 Sweet wormwood contains a compound named artemisinin, which is the leading treatment for malaria in the world. Sweet wormwood is rarely grown for anything but access to this compound. The leaves are harvested, and a solvent is used to leach the compound from the leaves. Tarragon (Artemisia dracunculus) is a culinary herb that is native to a wide area of the Northern Hemisphere. The best culinary herb is called French tarragon, to distinguish it from Russian tarragon, another cultivar, or wild tarragon, which isn't as flavorful as French tarragon. Tarragon grows in zones 5 to 8. It grows up to three feet tall and spreads up to two feet. French tarragon rarely flowers and its seeds are generally sterile. Tarragon is usually purchased at the nursery. 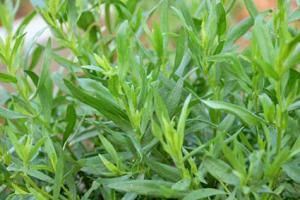 The seeds of the best tasting tarragon are usually sterile so it is propagated by root division. Tarragon should be planted after all danger of frost has passed. Tarragon likes moderate sun with a little shade in the afternoon. It prefers rich, loamy soil with good drainage. Adding compost to your soil is a good way to prepare it for tarragon. It is divided in the fall and replanted about 18 inches apart. It has a shallow root system and care must be taken during weeding not to damage the roots. Tarragon is used as a culinary herb to flavor soups and other dishes. It is harvested in summer and the leaves are dried for use later. The young shoots can be cooked as a potherb. Tarragon is thought to aid digestion and is often used to flavor oily foods. 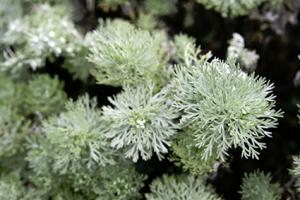 Wormwood (Artemisia absinthium) is a woody perennial that has beautiful silvery gray foliage. That is the primary reason it is planted. All parts of the plant should be considered poisonous. Wormwood is from the temperate regions of Europe and Asia and has naturalized in parts of the United States. It is considered invasive in some areas. Wormwood grows to three feet high by three feet wide. Wormwood is purchased from a nursery and is best grown in poor to moderate soils that are dry to moderately moist. It suffers from root rot in wet soils. It is drought resistant and rarely needs watering once established. It needs full sun to do best. Wormwood is propagated by dividing the root ball and planting the new divisions 18 inches apart. It can also be propagated from stem cuttings. Cut it down to its base in the winter. Wormwood is grown for its dramatic silver grey foliage. It makes a good border or accent piece. It is also grown to obtain plants to produce absinthe, a spirit that for many years was outlawed in the United States. It is again legal and is distilled from the whole plant. It was outlawed because it was thought to be addictive and psychedelic, but that has not proven to be the case upon further study, or at least no more than any other alcohol. 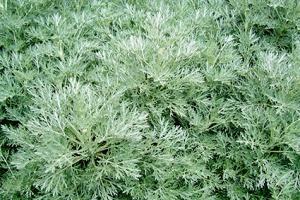 Artemisia is characterized for its beautiful silver grey foliage and is generally grown for that reason. In general, it makes a nice border or accent piece, is drought resistant, and is deer and rabbit resistant.